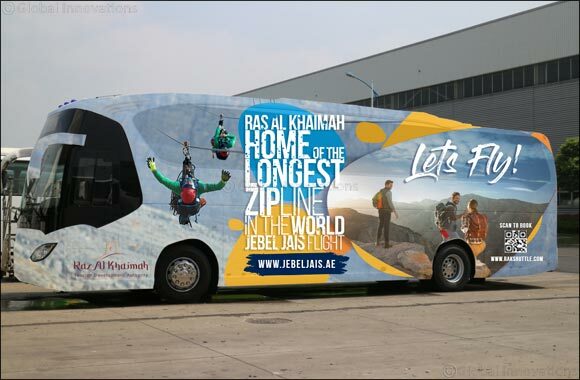 Ras Al Khaimah – UAE – 3 June 2018: Ras Al Khaimah Tourism Development Authority (RAKTDA) today announced that its RAK Shuttle service connecting Dubai Airport to the Emirate will be complimentary for visitors over the summer months. Free WIFI, water bottles and maps will be provided on board, giving tourists and residents alike the opportunity to enjoy a hassle-free start and end to their holiday or staycation in Ras Al Khaimah. Visitors will be able to plan and book their shuttle bus tickets online at www.rakshuttle.com, choosing between two convenient pickup points at Dubai International Airport (terminals 1 and 3), to enjoy a 45-minute scenic route with magnificent desert views, then dropped off at any of the main hotels in Ras Al Khaimah. The Emirate of Ras Al Khaimah is home to the World’s Longest Zipline and is the ultimate holiday destination for friends and families. With its 64km of coastline, unique desert landscape and the UAE’s highest mountain, it is one of the region’s most diverse destinations for a holiday of sun, fun, adventure and relaxation. The beaches and hotels offer a wide variety of activities while the desert and mountains are ideal for safari’s and nature trails. From Jebel Jais Flight: The World’s Longest Zipline on the UAE’s highest peak which is 10 degrees cooler in summer, to the Ice Land Water Park with its thrilling water slides and the Emirate’s malls which are a popular destination with a host of dining choices, cinemas and retail outlets, there’s plenty to do in Ras Al Khaimah this summer. Earlier this month, RAKTDA announced that visitors travelling to the Emirate this summer can take advantage of great hotel deals, and this summer, kids under 12 stay for free! Visit en.rasalkhaimah.ae/summer now to book with selected partners and benefit from a variety of enticing offers.